Most of us live somewhere near the intersection of unfulfilled dreams and limitless potential. 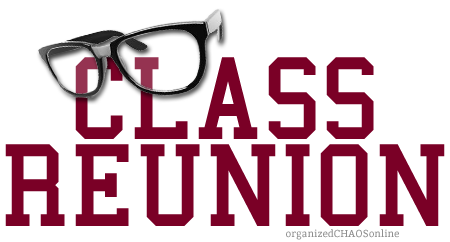 My 30th high school reunion was last weekend. Even writing those words makes me shake my head—30 years? It can’t be! Didn’t we just graduate a few years ago? How can it be three decades ago? I wasn’t able to attend, but it’s been on my mind a lot. But what’s been churning in me the last couple of weeks is more than nostalgia, deeper than the truth that time carries us faster and farther than we imagined. What’s been on my mind is more about trying to make sense of who I was back then and who I am now. The years have blurred my recollection of my former self and I feel oddly disconnected from that person. Who was I back then? My memory of High School Me was largely of an outsider (not by choice or design) who didn’t seem to fit cleanly into a group. If someone would’ve assigned me a category, it’d likely have been “nerd”, since I did well in school and took honors classes, and many of my school friends would likely have fit under the “nerd” banner. But I was also around cheerleaders and athletes (popular people), stoners and “ropers” (cowboys), though I didn’t fit cleanly into their groups either. And let’s face it, I was probably odder than I realized. Didn’t know how to dress right (nor did I have the money to), didn’t grow up with most of my classmates, so I didn’t have a shared history with them. I remember during homeroom my freshman year, I sketched a plan for a bank robbery that I showed to the girl behind me (Barrett). Who does that? I wasn’t a criminal, anti-social type, I was just bored. But seriously. My mind could be a strange place back then. If I had to pick a word to describe who I was to my high school, it’d probably be a Nobody. But then we graduated and the future was so expansive- we could become anything! Something! Somebody! For me, high school became a fixed memory because I moved from Texas to Arizona the day after graduation. I did get to take a memorable road trip with two friends later that summer (great memories, Randy and Robby), but quickly lost contact with everyone from those years. High school became more than a fading memory, though. It became a source of wistful regret. As the “Grown Up Me (a very loose term, I assure you) emerged, with slightly more clarity about who I am and my place in the world, I looked back and wanted a do-over. I wanted to try again, with a slightly improved sense of self and a much greater interest in and curiosity about others. I wanted to have made better friends, to have lived more fully, taken more risks. I guess you could say I have longed for redemption. In the occasional daydream, I’ve imagined what it would be like to make some sort of triumphant return. After all, I’m married to a beautiful and amazing wife and we have 3 incredible kids. I’ve been able to do more, travel more, “accomplish” more than I could have imagined. My life has been so much better than I deserve. But these daydreams are all so silly, because who would I be returning to try to impress? I imagine few folks from those days would even remember me, so there’s not much of a before and after “reveal” thing to pull off. And the truth is, though I am more at peace with Grown Up Me than I used to be, I’m really not all that impressive. Seriously. So what to make of this odd combination of nostalgia and regret mixed with gratitude and frankly, amazement at the goodness of my life? I don’t know. I’ve been told (and believe) it’s important to “feel the feelings” and not try to stuff it down somewhere. Writing this is part of that for me. And I know I can’t go back and rewrite the past. As much as I’d like a time machine to step into, I’m pretty sure Marty McFly’s not coming around the corner in the Delorean anytime soon. I think what I’m wanting to lean towards is greater compassion. Compassion for that insecure, nerdy kid from 30 years ago who was just trying to find his way and not make a fool of himself all the time. Compassion for others from those years who were trying to figure things out too, perhaps almost as unsure and uncertain as I was. Compassion for others who struggle to reconcile the gap between Who I Used To Be and Who I Am Now. Compassion for those who have made mistakes that have taken them away from who they wanted to become, but are trying to find their way back home. Compassion for us all. And I suppose that’s probably enough emotional gooiness for now. Before you know it, I’ll be grabbing hands with someone and trying to sing “We Are the World” together. Because that song came out my during my senior year. Really. Man, I do feel old. Great post, Richard. I can so relate to what you shared. I, too, was someone of a “lost soul” during high school. Because of a move, and economic hardship, I attended three different high schools in four years; missing a large part of my senior year due to some burbs suffered at my part-time job. Praise the Lord for all of that, however, as those painful years made me realize just how much I needed a firm foundation. Shortly after graduation, I began attending Grace community Church with my boyfriend’s parents. That was 1979. Fast forward 36 years… What a joy it was last Sunday, when I realized I was sitting right across the aisle from Guy Davidson. As soon as the last song was over I scurried over to shake his hand and gratefully thank him for introducing me to my Savior! What a joy to pray with him as he thanked God for making Himself known to me. Thank you, Richard, for the many years you have spoken truth into my life: challenging me, edifying me, helping me grow in my relationship with Jesus! Keep writing … Using your gifts in His service, brother. God bless you and keep you … All of you. You are missed at GCC.